Introducing the first in the new Fast Favourites video series, which takes short-yet-satisfying looks at a the shiniest gems in the NGA collections. First up for the chop: The Lovers by Pablo Picasso. In 1907 Pablo Picasso (1881-1973) had stunned the art world with what would later be recognized as the first Cubist painting: Les Demoiselles d’Avignon was inspired by tribal art and proposed a new way of seeing reality, namely simultaneously from all angles. 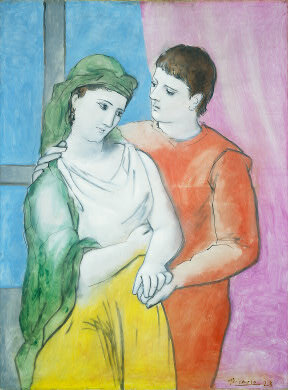 Our painting here, The Lovers (1923), was a complete departure from that work: Picasso never limited himself to a single style for long since he was so versatile and imaginative.